The Pacific War Online Encyclopedia: Phillips, Sir Thomas S.V. Via Wikimedia Commons. Cropped by author. Thomas Phillips entered the British Royal Navy in 1904 and served in cruisers in the First World War in the Mediterranean and Atlantic. By the start of the Second World War he was vice-chief of the Naval Staff. Though he had spent most of his career as a staff officer, he was chosen to lead Force Z at Singapore just prior to the outbreak of war in the Pacific. 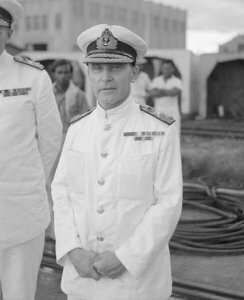 Though regarded as the brains of the Royal Navy during the early months of the war, Phillips has been excoriated by many historians as a desk admiral who failed to realize the potential of air power, and thereby brought disaster onto his command. This may be unfair. Accounts of his actions off Malaya in the opening days of the war indicate that he maneuvered Force Z to stay out of range of air attack, called in vain for fighter support, and was finally caught by Japanese bombers at the limit of their range, which Allied intelligence had underestimated. Prior to his final sortie, he had recommended in vain that his force be sent to the Indian Ocean and reinforced with two more old British battleships. When Force Z met with disaster, Phillips went down with Prince of Wales. A very short man, he was known as "Tom Thumb" by colleagues and as "the Pocket Napoleon" by James Somerville. He had a tendency to lose his temper when his ideas were obstructed. He was resented by many officers for being too subservient to Churchill and for meddling in operations. However, Phillips had opposed Churchill on the decision to retaliate for German strategic bombing and on the decision to send an expedition to Crete.